As the weather cools down the momentum on heritage warms up. We are pleased to inform you of an upcoming community presentation, sponsored by the District of Oak Bay, on Learning About Heritage Conservation: Practices and Insight From Around the World. 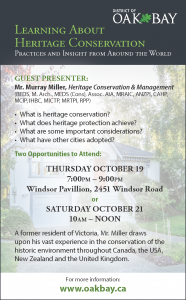 The presenter is Murray Miller, a retired Senior Heritage Planner with the City of Victoria until 2015. He has worked extensively in the development, education, and administration of HCAs over 30 years and in four countries. Please note, there are two opportunities to attend this repeat presentation. Each session will be held at Windsor Park Pavilion at 2451 Windsor Road (map). As you will remember, the Oak Bay Heritage Conservation Area Working Group is being established. Our three representatives are Barb Grant, Robert Longe and Michael Prince. The Chair will be Councillor Kevin Murdoch. The names of the remaining six members will be made public in the next week. The presentation by Murray Miller is a first step in informing and engaging the community about heritage conservation and, in turn, about our HCA project. Public engagement and participation are key to the HCA project.